Available at any of our registers for any denomination. These are great for birthdays, graduation, giveaways, corporate appreciation gifts, etc. You may redeem gift cards on tickets, concessions, and food items. Give the gift of movies with a Brokaw Gift Card! Looking for great savings? Pre-buy your tickets with the below packages and save huge on tickets! Individual – 5 movie tickets for $28 - Limit 1 ticket redemption per visit. Couple – 10 movie tickets for $50 - Limit 2 ticket redemptions per visit. Family – 25 movie tickets for $140 - Limit 5 ticket redemptions per visit. All members receive a free small popcorn every time you use your Silver Screen Rewards Card. Rewards cards expire 12 months after purchase date. 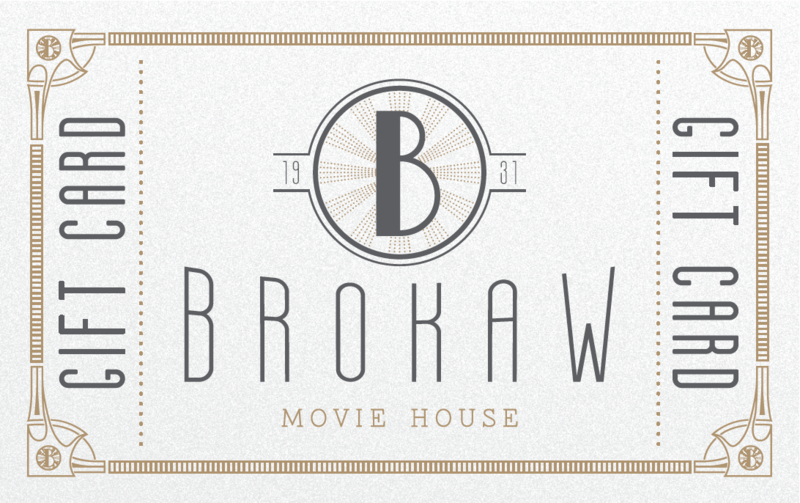 Show your Brokaw swag with one of our Brokaw Movie House t-shirts. Available for sale at either the concession counter or at the bar. We have sizes ranging from Small to 2XL. These also make great gift items for movie fans!